VANCOUVER, British Columbia (AP) — Zlatan Ibrahimovic had a goal and an assist as the LA Galaxy beat the Vancouver Whitecaps 2-0 on Friday night. Daniel Steres also scored for the Galaxy (4-1-0). 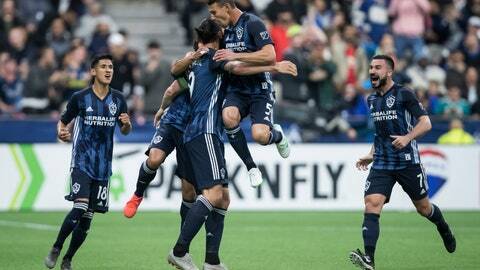 Maxime Crepeau stopped one shot for the Whitecaps (0-4-1) while his teammates blocked four. David Bingham had five saves for LA for his first shutout of the season. The Whitecaps were able to contain Ibrahimovic and the Galaxy’s other stars throughout much of the first half but struggled early in the second. LA capitalized in the 63rd minute when Ibrahimovic sailed a ball to Steres in front of the Vancouver net and Steres headed it in. The Galaxy added another goal in the 71st minute after Rolf Feltscher sent a high ball into the box from the right corner. Ibrahimovic knocked down the pass with his body, then fired it in past Crepeau. A fan wearing a Swedish Ibrahimovic jersey ran onto the turf and up to the Galaxy captain in the 85th minute. Ibrahimovic appeared to sign the man’s shirt before he was escorted off the field by security.